033. THE "TERRA NOVA." Issued by Wills Cigarettes, W.D. & H.O. Wills; The Imperial Tobacco Co (of Great Britain and Ireland) Ltd. (1911). 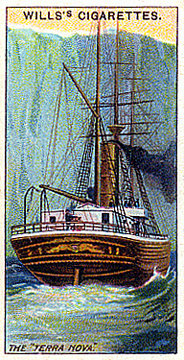 Card number 35 from a set of 50 entitled "Celebrated Ships." Size: Ca. 1.4" x 2.68". Recto: Stern view of the Terra Nova with ice barrier beyond. At top: WILL'S CIGARETTES. At bottom: THE "TERRA NOVA." Verso: No. 35 | CELEBRATED SHIPS | WILL'S CIGARETTES | The "Terra Nova." | In June, 1910, the Terra Nova, well equipped for Captain Scott's dash to the	South Pole, left London for New Zealand. She is one of the finest of the old Scottish whalers, and was built at Dundee, 1884. She had previously taken part in the Discovery Expedition to the Antarctic (1903), and in the North Polar Expedition (1905). | W.D. & H.O. WILLS, | BRISTOL & LONDON. | ISSUED BY THE IMPERIAL TOBACCO CO. | OF GREAT BRITAIN & IRELAND LTD. On left margin: Albums for these pictures cards can be obtained. On right margin: at 1/- each from all tobacconists.